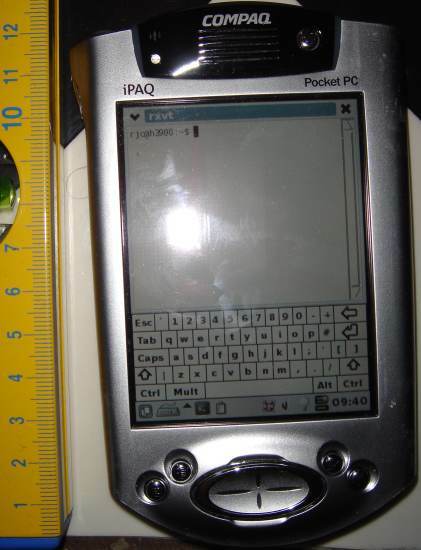 Since about 2002 I have been using a iPaQ  for taking notes while on the move. I have a pair of H3950 iPaQs that were given to me for the purpose of some software development work. As modern mobile phones have telephony as a small part of their feature set I think it’s worth comparing a 2002 iPaQ with a 2009 mobile phone in terms of the note taking functionality. I have just got myself an LG U990 “Viewty” mobile phone . It has a screen resolution of 240*320 which is the highest resolution that is remotely common for a mobile phone – and the same resolution as my 2002 model iPaQ. The LG KC910 “Renoir” has a resolution of 240*400 and seems to be the only phone that my carrier provides which has a higher resolution. The iPhone  has a resolution of 480*320. So it seems that the most expensive modern mobile phone that is available in Australia has a screen resolution that is only twice that of a 2002 PDA. I believe that in Japan you could buy a PDA with a higher resolution than 240*320 in 2002. My iPaQ is running Linux, so I can do whatever I want with it. I have a bar at the bottom of the screen with icons to launch, I configure it with the programs that I need most often and they are always one click away. While with my mobile phone I always have two large icons for paid services from my telco and I can’t add icons for the things that I want. 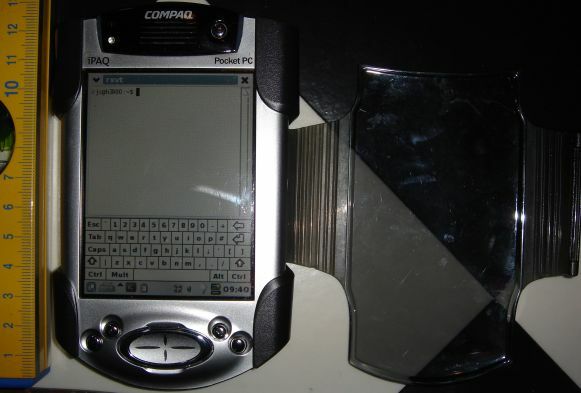 My iPaQ has a virtual keyboard that can be displayed in portrait or landscape mode. The above pictures show it in the portrait mode which allows the greatest area of screen space for text. The landscape mode is good for entering long lines of text even though the total number of words that can be displayed on screen is smaller. 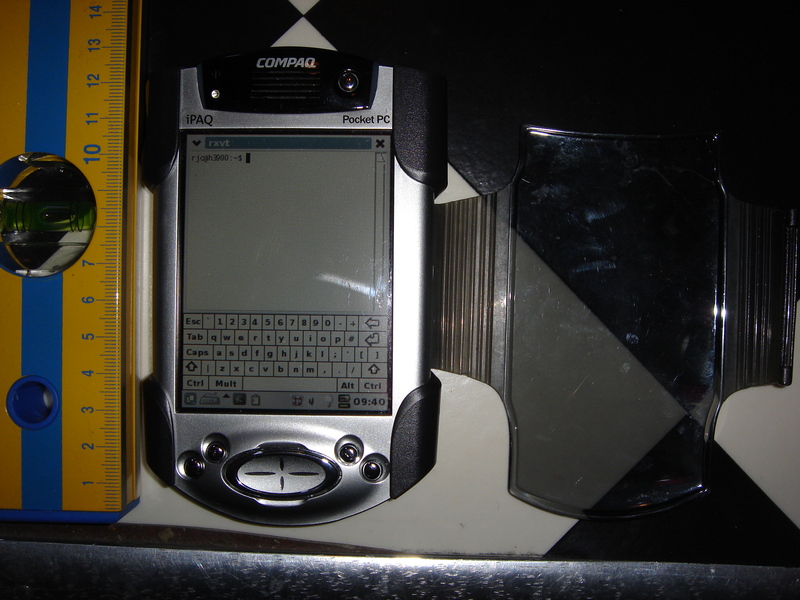 The size of my iPaQ is 134mm in height, between 77 and 84mm in width (it tapers) and 15.9mm thick without it’s protective sleeve. The protective sleeve (shown in the second picture) adds about another 5mm to the width and thickness. My iPaQ is 1.76* the volume of my Viewty phone and at 184g vs 112g is 1.64* the mass. With it’s sleeve on it is about 2.4* the volume. It’s larger but with the sleeve it’s a lot more solid, a touch-screen is very fragile so putting a touch-screen device in your back pocket without a sleeve is not a viable option. So I now own a mobile phone that has more storage, RAM, and CPU power than my iPaQ, but is less useful for the basic task of writing small documents and seems to have no facility for drawing diagrams. Most recent mobile phones have the ability to record voice (my Viewty can store 34 hours on it’s internal storage and supports mini-SD cards for extra storage). But my Viewty lacks the ability to pause voice recording so if I wanted a series of notes during a meeting I would get a series of short voice recordings rather than a single file with many items. 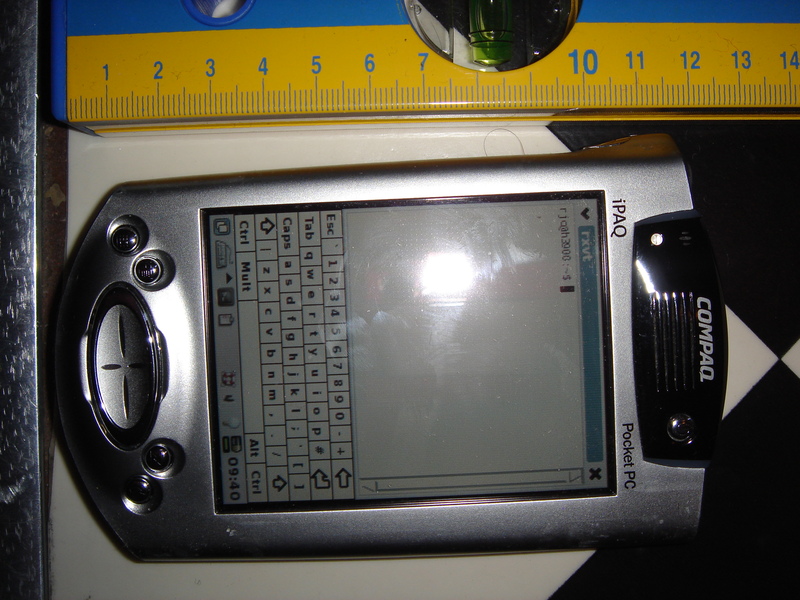 The todo list is also fairly poor in the Viewty, so even disregarding the poor keyboard on the touch-screen it would compare badly to the iPaQ. So it seems that an iPaQ that is almost seven years old when running Linux and the GPE Palmtop Environment  with with default configuration handily beats one of the latest and greatest mobile phones for all areas of common functionality. If the Viewty had it’s source code available I would be tempted to contribute some patches (even if it was not free software). Finally, before someone suggests an Android , Greenphone  or other phone that’s relatively open and programmable, I wanted a phone that had a good camera (by phone standards) and came essentially for free on an affordable contract. Maybe in two years time (when my current contract ends) there will be such a phone on offer. Mobile phones aren’t THAT important to me, so while I would like to encourage the development of open telephony platforms it’s a much lower priority than about a dozen free software projects. I expect that in the future something like an Android will become a great mobile phone with great PDA functionality. But for the moment I’ll use an iPaQ and a Viewty. The Viewty does have a 400×240 screen. I would suggest you look into J2ME for customization of the Viewty. I suspect there is not a lot of touchscreen-enabled software, but you can get a decent toolchain (although I seem to remember that the LG’s Viewty SDK is Win32-only). It is a nice post, because I guess there are a lot of people like us. Well, just one to say it, nice post, and greetings. Nice post, i’m googling to see if I can find a phone which I can use for easy note taking. Not having much luck phone makers don’t seem to see this as a useful feature. Saddened to see that an ancient iPaq is much better and has linux wow!